Since its doors first opened in the Spring of 1988, Butterfly World has introduced hundreds of thousands of visitors to the wonders of Lepidoptera and the natural world around us all. The facility is the largest butterfly house in the world today. Bask inthe miracle of live butterflies from five continents together, flying, feeding and basking in the sun. Wonder at the beauty of tropical birds soaring and singing. Fill your senses with color and fragrance exploring flowering gardens on land and water. Amidst thousands of flowers, tropical plants, waterfalls, gardens, and classical music, Butterfly World is a unique, breath-taking site that is one of Florida's leading tourist attractions. It is typically home to 80 butterfly species from South and Central America, the Philippines, Malaysia, Taiwan, and other Asian nations. Some of the favorites include the Owl butterfly, and the brilliant Blue Morpho. Enter a world of fantasy in the Secret Garden. Make your way through the maze-like vine-covered canopy that houses one of the largest collections of flowering Passion Vines in the world today. Discover beautiful statuary, giant Dutchman's Pipe blossoms and even a wishing fountain. Hanging bunches of lavender flowers, the trademark blooms of the elegant Sky Vine, can be found throughout. Don't forget to look above the canopy to enjoy their native butterflies, feeding on the blooms above. Directions: Take turnpike exit at Sample Road and head west. Enter into Tradewinds Park on the south side of Sample Road, only a quarter of a mile west of the Florida Turnpike. Our butterfly house is inside the park, straight ahead about a third of a mile. 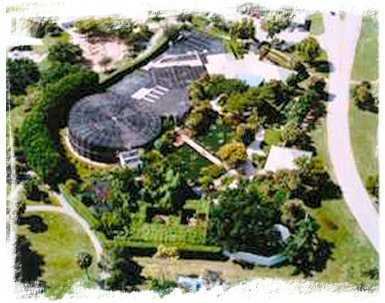 Below you can see Butterfly World's spectacular gardens and aviaries.